Most latches for walk gates are designed for residential application. To protect your commercial or industrial property, you need walk gate latches that have the strength, durability, and convenience of a latch designed specifically to meet industrial standards. International Security Products understands the need of all industrial fencing and security needs, and manufactures an exclusive industrial walk gate latch that incorporates the heavy duty construction, tamper-resistant design and security features that give your chain link fence the security, long-life and convenience you demand. Our PL152W Industrial Walk Gate Latch (also known as the Pioneer Latch 152W) has become an industry standard and is widely used by utility companies nationwide. The PL152W latch is designed for maximal security. It is easy to install and use. Our PL152W Commercial Walk Gate latch is made in the USA. It is a heavy duty industrial walk gate latch that weighs 8 lbs., and features heavy duty steel construction with a hot dipped galvanized finish. 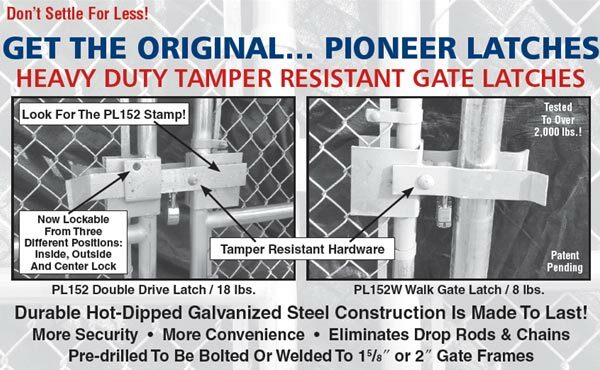 We have recently improved upon the PL152W by adding “tamper-resistant” hardware that makes our latch even more difficult to disassemble once its on the gate frame, unlike other latches on the market. The padlock location is centered beneath the latch for security as well as convenience and can be accessed from both sides of the gate. The PL152W can be either welded or bolted to the gate frame. The latch is designed to fit onto either a 1 5/8″ or 2″ O.D. gate frame and will close on either a 3″ O.D. or 4” O.D. latch post (please specify latch post O.D. when ordering). Custom orders for the latch to close on any other outside diameter latch post are available, and can be quoted. For availability and additional pricing information including freight cost, you can either contact International Security Products directly, or call your nearest Merchants Metals or Master Halco facility. Make sure you get the original PL152W manufactured by International Security Products.